On this day in Duluth in 1896, the body of Charles F. Johnson was laid to rest in Forest Hill Cemetery in a Masonic ceremony that began at the Masonic Temple at Second Avenue West and Superior Street. Masons and members of the Grand Army of the Republic (GAR) marched with the hearse to Lake Avenue and Second Street, then took chartered streetcars to the cemetery. 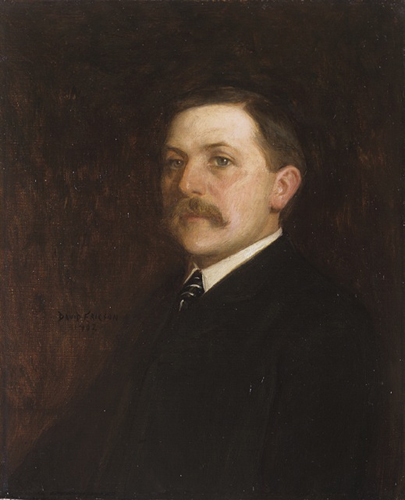 Johnson had died of tuberculosis two days earlier at the age of 53. Johnson was among those who founded the Mason’s Palestine Lodge in 1871 and was a Union veteran of the Civil War (the GAR was a Civil War veterans group, much like the V.F.W. or American Legion). While serving with the Ninth New York Volunteers he was wounded in the battle of Antietam. Following the war he wrote a memoir of his experiences titled The Long Roll which featured sixty of his sketches; it wasn’t published until after his death. In Duluth, Johnson was known for his work as the federal customs clerk, but he played a big role in Duluth’s early history. He and his wife Mary moved to Duluth in 1869, and he set up the Pioneer Book and Stationery store. The next year he established Duluth’s first Free Circulating Library. He remained in the book trade until 1889, when he took the federal job. His early sketches of Duluth include the only known image of the temporary wooden bridge that helped people cross the canal in the 1870s. Read more about Johnson here.